An undated photo provided by the FBI shows Wade Michael Page, who went on a killing rampage in a Sikh temple in Oak Creek, Wis. The gunman who killed six people and wounded four others at a Sikh temple in Wisconsin before being shot by an officer died from a self-inflicted gunshot wound, the FBI said Wednesday. 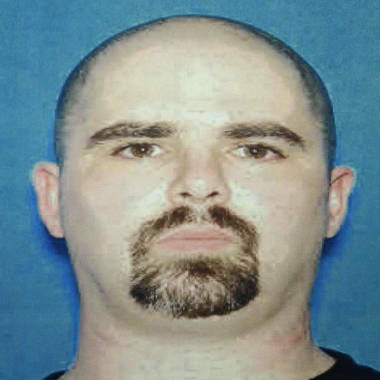 Wade Michael Page, 40, died at the scene of Sunday’s mass shooting at the Sikh Temple of Wisconsin in Oak Creek. Authorities originally said Page was fatally shot by an officer responding to the scene. At a press conference Wednesday, Milwaukee FBI Special Agent in Charge Teresa Carlson said investigators have since determined that Page shot himself in the head after wounding one officer and being shot in the stomach by a second officer. Teresa Carlson, the lead FBI investigator in the probe of the Sikh temple shooting in Wisconsin, tells the media that suspected gunman Wade Michael Page died from a self-inflicted gunshot. "The evidence indicates that the second responding officer who shot Page in the stomach, thereby neutralizing the threat -- and by the way, I've seen the video, it is an amazing shot. And thank goodness. Subsequent to that wound, it appears that Page died of a self-inflicted gunshot wound to the head," Carlson said. Authorities reiterated Wednesday that it appears Page, who reportedly had ties to white supremacist groups, acted alone and that they still have not determined his motive. Carlson said investigators have conducted more than 100 interviews nationwide of family members, associates, employers and neighbors. They are also analyzing Page's computer, email and telephone records. The video surveillance system inside the temple was not turned on Sunday so there's no recorded view of what happened inside the 16,000-square-foot building, Carlson said. Page’s ex-girlfriend, Misty Cook, 31, was arrested Sunday night after police found an illegal gun in the home she once shared with Page. Carlson said Wednesday neither the gun nor Cook was connected to the shooting at the temple. Authorities said Page, a former Army sergeant, entered the gurdwara shortly before services were to begin and opened fire with a 9mm semiautomatic handgun. Among the wounded was a police officer, Oak Creek Police Lt. Brian Murphy, who was shot multiple times. “He was up walking yesterday,” Police Chief John Edwards said at Wednesday’s press conference. 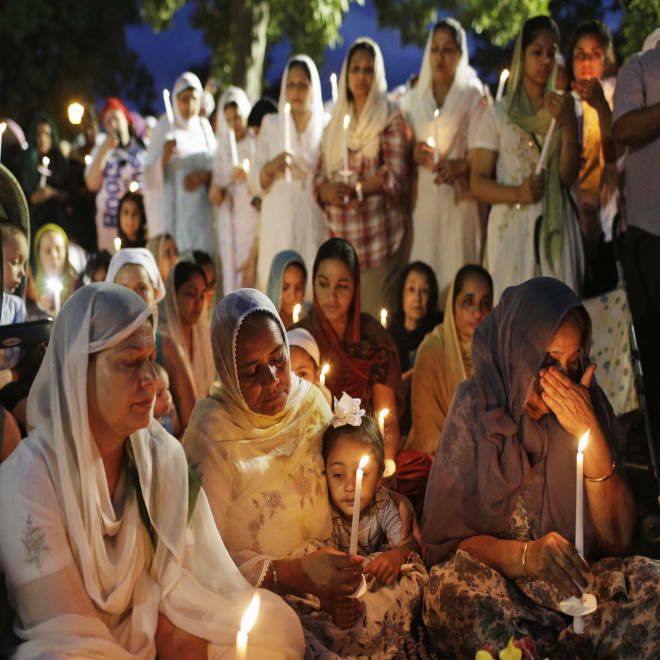 Sikhs attend a vigil in Oak Creek, Wis., on Aug. 7, to honor the victims of a shooting spree at a Sikh temple. On Tuesday night, hundreds of residents attended the annual “Night Out” in Oak Creek, transforming the neighborhood event about public safety into a poignant quasi-vigil for the victims of the mass shooting. Attendees held candles and prayed for the victims, remembering them as peaceful individuals dedicated to their families and faith. President Barack Obama called Indian Prime Minister Manmohan Singh on Wednesday to express his condolences over the shooting, the White House said. "The two leaders spoke about their shared commitment to tolerance and religious freedom, and the president again reiterated his appreciation for the significant contribution that Sikhs make to the broader American community," White House spokesman Jay Carney told reporters aboard Air Force One.